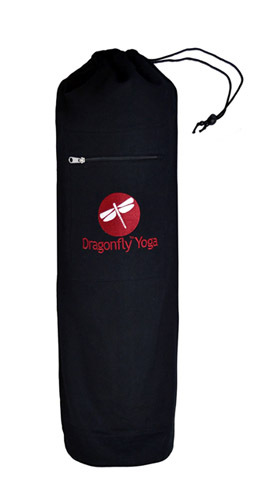 What is the perfect companion to any Dragonfly Performance Yoga Mat? A Dragonfly Embroidered Yoga Mat Bag, of course! Our sling-style mat carrier will have you travelling to the studio, gym, or a business trip in style. Although the design seems simplistic, this mat bag has everything you could need: an easy to use drawstring top with simple toggle lock, extra large size for any sized mat, an exterior zippered pocket with an embroidered Dragonfly logo, a wave-patterned embroidered adjustable shoulder strap with durable metal buckles, a secret inside zippered pocket — large enough to fit an ID, cash, keys, and an iPhone! I like this bag a great deal. It has more room for storage than the other bags that I saw. I have had a lot of compliments on it from other Yoga practitioners. Great quality, and was very useful, for the Yoga Journal expo event, I attended. Love it! The best thing about this mat sling is that it is large enough for my Jade mat and a hot yoga mat towel on top rolled together. I can just roll them up and pop it in with ease. My last mat bag zipped through the length of the bag and the top-loading bag is much easier to use. Quick and easy, the cotton is durable and soft and the pockets are convenient for ID''s, cash, and keys. Plus, it makes yoga mat storage attractive. A+; thanks Dragonfly!